I'm new to studio photography. And wanted to dabble with some stereotypical portrait shots. Looking at soft boxes on ebay there is a wide discrepancy of prices. I'm torn because I won't be making money from this, its only a hobby. But on the flip side I don't want to waste $50 to realise I should have paid $400. Some selling for $50 with others going up to $500. As a beginner can I get reasonable results from the bottom range? Shutter Speed - The extra light from the Speedlight and strobes will allow for higher shutter speeds and less chance for blurry images. Hotspots - Speed Lights and strobes in softbox, need a good translucent screen (in some cases 2) for the light to spread evenly and not create specular highlights on the cheeks and forehead. Constant 5500k lights are generally softer and don’t produce hot spots through cheaper softboxes. As a foot note, I started off with constant lights but upgraded to a strobe and softbox within just a few months But I struggled, and it was only when I worked with a photographer who introduced me to just one cheap flashgun and a translucent white umbrella with a silver and black backing, that I understood how to light a portrait. My advice to any newbie is to start with a cheap single flash that can be optically triggered via the DSLR and a cheap translucent white umbrella with a silver and black backing. This allows the photographer to get as much light as possible, try the flash straight though, bounce off the silver or white background and be able to determine where the light needs to be modified to the create the desired effect. I'd say, if you are going to be shooting any significant amount of video as well as stills, then the continuous lighting is a cheap & cheerful way to get into it. The downsides of that type of rig are two-fold. 1. For stills, getting them in close enough to try compare to speedlights in brightness means your model will be squinting in the permanent glare. 2. They are adjustable only by adding/removing bulbs - those systems come with up to 4 sockets in each head. For a fair bit more money - maybe £300/500AUD you can get controllable LED lights, brightness & colour temperature - flicker-free. The other downside, squinting, will still be there. If you're looking at the opposite end of the functionality range, but staying at the budget end of that, I've nothing bad at all to say about Godox. I have 2 of their speedlights & their 2.4GHz radio controller. They may not cycle quite so rapidly as the 3x more expensive Nikon speedlights, but in all other respects I can tell no difference. If you buy into their radio system - which I would recommend over optical triggers - you can control up to 4 independent lighting groups/banks all from the transmitter on the camera. Adding the studio flashes to that would give you the control of speedlights plus the modelling light ability built-in to the system, rather than relying on the battery-flattening equivalent if you used speedlights alone. That leaves the middle ground - get the same trigger system but use speedlights in soft-boxes. Two of their top speedlights plus the radio remote for maybe 600 AUD. The only downside I can see is that you have bought into their 2.4GHz system, which is unlikely to be compatible with anyone else's for now. The upside is it's not dependant on line of sight & if you take it outdoors is good at a much greater distance. They make a lot of variety of lighting which can use that system & make separate trigger receivers for lights that don't. I don't want to make this sound like an advert for Godox, & of course there are other contenders, mainly from China too - but if you have limited budget & you're never going to recoup the expenditure, then you may have to buy into one manufacturer's budget system - so check out the capabilities of their entire range before committing. One last consideration - whatever you get... get a minimum of two to start with. There is no such thing as 'too many lights'. There's a fundamental difference between the two examples in your question. One is a set with continuous lighting that uses lights that are basically not much different from the ones the fixtures in you home use. The other is a single strobe unit that can give you much more intense bursts of light, but only for very short time periods. Obviously continuous lights are better for shooting video, where constant output is needed. For shooting still images, strobes usually give you more power per dollar (or whatever currency you use), are generally more controllable - both in terms of ease of control and amount of control - and are usually more comfortable for any live models that may be involved. Constant lights that use fluorescent technology can also present problems due to flicker based on the frequency of the alternating current that powers them. This can limit the shortest shutter time you can use to even longer than your camera's flash sync speed when using strobes. For places with 50Hz mains electricity, this means about 1/100 second or longer. For places with 60Hz AC, it's about 1/120 second. This, combined with their relatively low power compared to strobes, means you can't stop action with continuous lights the way you can with strobes. Even with a slow sync speed of, say, 1/160 second you can freeze a moving subject using a strobe because the actual flash of light may last for only somewhere between 1/1,000 and 1/20,000 of a second. If the ambient light is dim enough or, even better, non-existent during the exposure then you could leave the shutter open for several seconds and it wouldn't matter at all. You'll only expose your subject for the 1/20,000 of a second when the strobe is outputting light! For shooting still images, strobes are almost always preferable to constant lights. The ability to adjust the power of each light independently and quickly opens up an entire world of creativity that you just can't get with non-adjustable continuous lights. 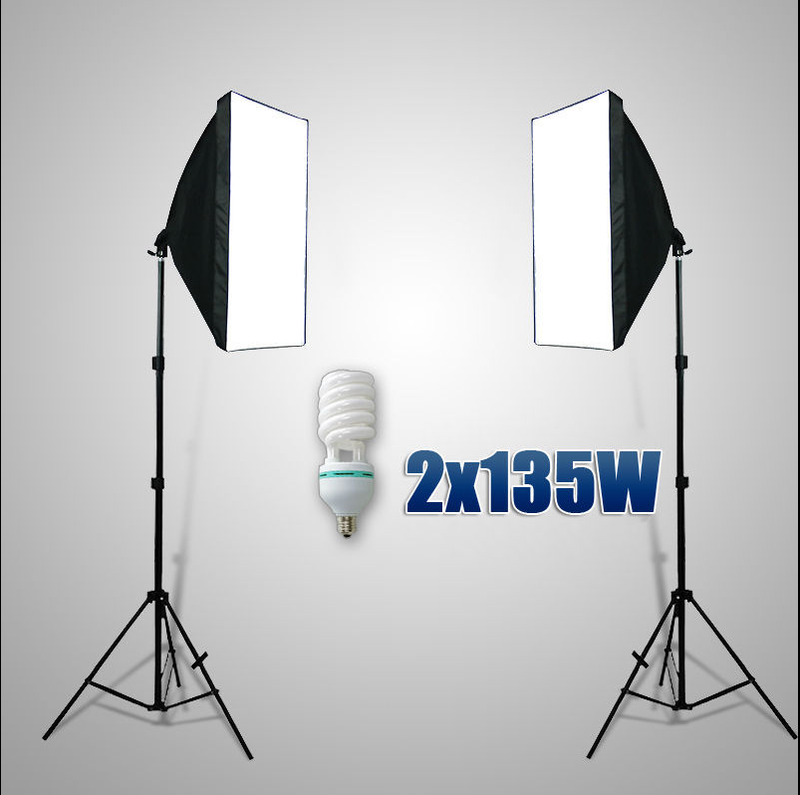 To change the power of the cheap continuous lights in your example you need to take the entire fixture out of the softbox and add or remove some of the 3/4/5 bulbs in each fixture. The difference between one and five bulbs in your continuous light example is nowhere near as great as the difference between a strobe at full power and the same strobe at 1/16, 1/32, 1/64, or even 1/128 power for some strobes. There is some middle ground between your two examples. 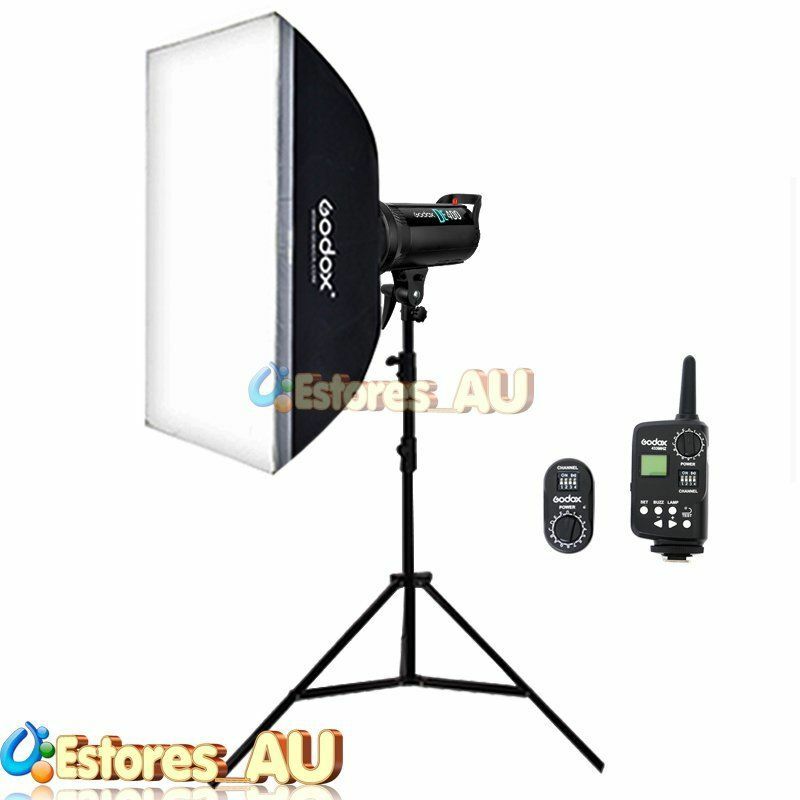 Instead of buying a studio strobe such as the Godox DE400 in your second example, buy a couple of "speedlights" that can be placed inside softboxes. The Godox DE400 had a pretty good cost/benefit ratio (The DE series has been supplanted by the more up to date DP series, now in version "II"). But for getting started, you can get something like two of the Godox TT685 for the same cost as the basic DE400 (without the rest of the kit in your example). The nice thing about the Godox 2.4GHz wireless system is that everything, from the most basic manual-only speedlights to the highest end TTL-capable studio lights can all be controlled by the same controllers, either the XPro or the X1. One more note on the examples in the question: The Godox 400DE kit includes an XT16 controller. The XT16 is a manual only transmitter. If you think you might ever want to use TTL (through-the-lens automatic flash), you should go with an XPro or X1 transmitter instead. The XPro and X1 can control everything manually the way the XT16 can, but can also control the TTL functions of TTL-capable flashes that the XT16 can not control. Not the answer you're looking for? Browse other questions tagged equipment-recommendation lighting studio-lighting studio-setup softbox or ask your own question. Studio lighting: Is strobe the same as triggered flash?